When I read the Birmingham News report about Bistro Two Eighteen, I have to admit, my feelings were mixed. It’s a new restaurant downtown (yay!) in a historic building (yay!) from a Birmingham-born, culinary-school-educated chef (yay!) with a that’s only open for lunch and during the week (boo!) and has a weird confusion of a “French” menu that includes classics like quiche Lorraine as well as burgers and gumbo (boo!). I stopped by for lunch last week (the restaurant’s second in business), and I’m glad to say the food is better than expected! The place is similar in feel to Chez Fon Fon and Chez Lulu but with lower prices than the former and larger portions than the latter. The food is mostly French, though there’s gumbo on the menu and they were playing New Orleans jazz, so maybe they’re going for a little Creole influence too. And for some strange reason, they have shrimp and grits available as an appetizer. I understand you’re in the South, but if you’re going to be a French restaurant, be a French restaurant. 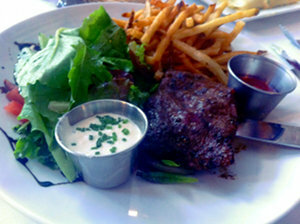 The specialty of the house seems to be steak frites—you can’t go wrong with meat and fries. It’s a pretty good portion of flatiron steak, with two options of sauce: horseradish cream or chausseur (a mushroom, tomato and tarragon combo). I ordered mine medium, and it came out exactly right, paired with a simple salad. And those fries are excellent: skinny and super-crunchy, and they stay that way even after they cool off. The whole deal is $12, a bit steep for an everyday lunch but a very good price for what you get. What do you do after building a highly successful chain of barbecue restaurants? 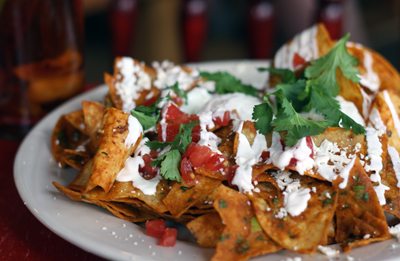 If you’re the people behind Jim ‘n Nick’s, you open a high-end Mexican restaurant. I’ll admit, I didn’t have very high hopes for Little Donkey when I first heard about it, but one taste cleared away all my doubts. I was invited to the place on opening night last week for a media “preview,” and just about everything was fantastic. 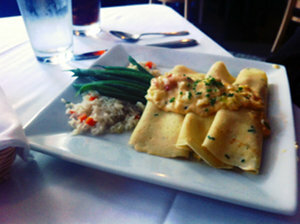 A couple weeks ago, I had the privilege of attending a Four Coursemen dinner here in Birmingham (at Little Savannah). The Coursemen are a group that started putting on underground dinners in Athens, Ga., a little more than five years ago. They’ve since gained national fame, including a Cooking Channel show, and their dinners routinely sell out in seconds. These guys (there are six of them, and not all are trained chefs) are right on trend for the food world. They’re all about local ingredients and regional dishes. They spent two days before the dinner visiting farms and other food purveyors in the Birmingham area, tweeting enthusiastically about everything they found. And then they turned it into an impressive five-course meal. So remember Pianeta 3, the pizza joint in Mountain Brook Village that opened, oh, seven months ago? Yeah, it’s long gone. Such is the way of promising Birmingham restaurants. But what replaced it just a couple weeks ago is the new spot I’m perhaps most excited about, maybe since I moved here. 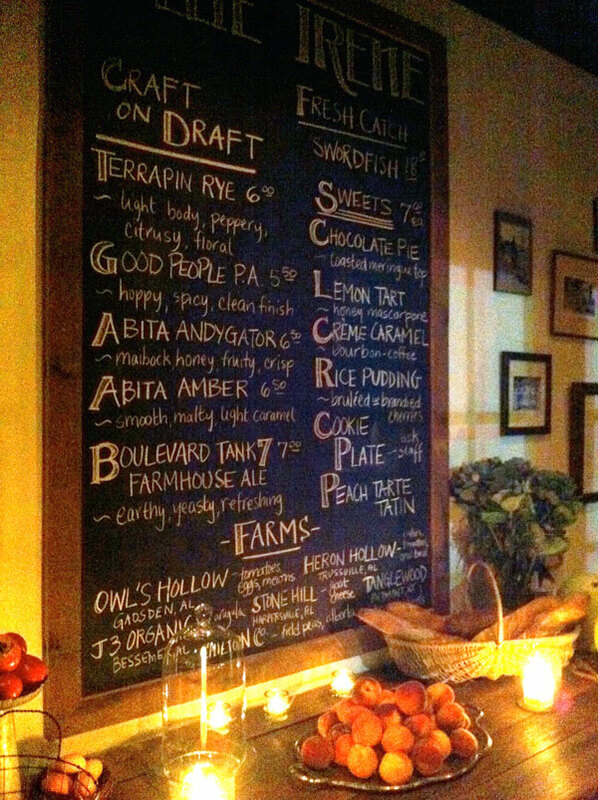 Ollie Irene is an honest-to-God gastropub, a kind of restaurant we didn’t have any of before but which is wildly popular in bigger cities. Basically, you take a casual, comfy British pub-style atmosphere and serve high-end cocktails and food in it. Simple enough idea, and there are lots of famous ones around the country. And now Birmingham is home to an excellent one. Which also happens to be run by a pair of extremely nice people who have their hearts in exactly the right place. And you should check it out. I think food trucks have finally hit the tipping point in Birmingham. Food trends seem to get to this town about five years or so after they break in New York, LA, and San Francisco, so the timeline is about right. And now joining that crowd is Shindigs. 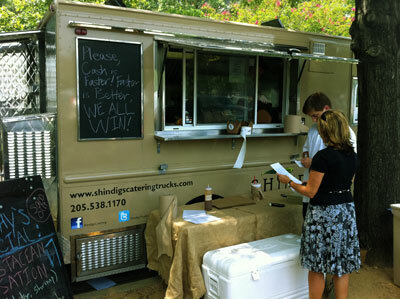 A catering company started by a pair local restaurant veterans, Shindigs joined the mobile-cuisine world a couple weeks ago with the truck you see above. It’s been catering to the UAB crowd during the week, parking on 20th Street between 6th and 7th Avenue South, and heading to Railroad Park on Saturdays. Reading Shindigs’ menu and cooking philosophy gives me foodie goosebumps: It’s committed to using local, organic produce and humanely raised meats; its burger buns are custom-baked at Continental Bakery; there’s even a truck-made veggie burger! So I had to check it out, and picked up lunch last Friday. The food is damn promising, but some of it, especially that veggie burger, could use some work.